Inspired by the classic interiors of England's historic homes, this collection of supremely elegant fine bone china tableware draws on the Regency period's fascination with the three-dimensional forms of ornate stucco plasterwork. Each 30cm bone china plate features hand-drawn artwork developed by our own design team in Stoke-on-Trent. The Regency collection of fine bone china tableware is inspired by the classic interiors of England’s historic homes. This supremely elegant collection of bone china dinnerware draws on the Regency period's fascination with the three-dimensional forms of ornate stucco plasterwork. 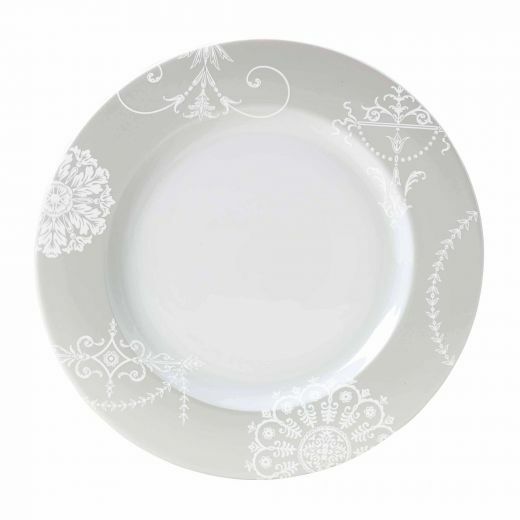 To bring this enduring style of design perfectly up to date for your own home, William Edwards Home has added the contemporary touch of a metallic white background to each 30cm fine bone china plate – with hand-drawn artwork developed by our own design team in Stoke-on-Trent.